The 7th class will be on April 02, 2012, at Altes Finanzamt, Schönstedtstraße 7, in Neukölln. 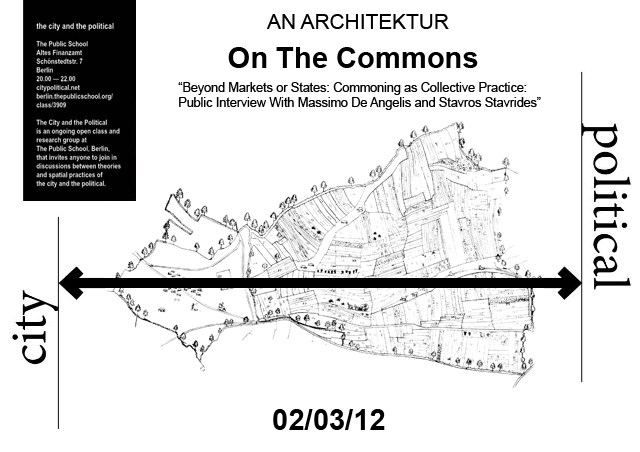 We welcome everybody to join our discussion on AN ARCHITEKTUR‘s “On the Common’s” issue. We will focus the discussion on “Beyond Markets or States: Commoning as Collective Practice: Public Interview with Massimo De Angelis and Stavro Stavrides.” You may find the text (with additional primary source excerpts) here: http://www.mediafire.com/?3ylnzos4lc31qy8, or at e-flux, here: http://www.e-flux.com/journal/on-the-commons-a-public-interview-with-massimo-de-angelis-and-stavros-stavrides/. Massimo De Angelis is a professor and edits The Commoner: a web journal for other values. On De Angelis’ editorial blog, I found the first video below on ‘CONSENSUS’. A video produced by the team “aformi” which focuses on self governed occupied places in Athens and their characteristics as developed or created by the December uprising. Contains interviews of people participating in these initiatives as well as an interview of S. Stavrides on the meaning of public space and the right to the city (can be dowloaded in high resolution).